First Christian Church - SERMONS - Has Jesus Been Born in You? During this time of year, we celebrate the birth of Jesus into this world. He did not come from the human race. He came into the human race from above, in order to experience everything we experience and save us from our condemnation due to sin. Jesus Christ is God in the flesh, not man becoming God, but God coming into human flesh, coming into it from the outside. His Life is the Highest and the Holiest, entering into this world at a lowly manger, through the humble Virgin Mary. Just as our Lord came into Mary from the outside to be born into the world, so He must come into us from the outside to be born in us. The critical question is: has Jesus been born in you? This question is critical because we cannot enter into the Kingdom of God unless Jesus is born in us through the Holy Spirit, giving us a spiritual birth totally unlike a natural birth. We make a huge mistake by thinking the new birth means nothing more than rising up and doing better by our own efforts. Jesus told Nicodemus, a very righteous man according to the law, “You must be born again,” that is, something must come into you from the outside. The conception of this spiritual birth is that something enters into us. That something is the Holy Spirit, the Spirit of Christ, which is the Spirit of God. The Father, Son, and Holy Spirit are one God, with separate roles. Therefore, whether we say Jesus or the Holy Spirit enters into us, it is the same God in us. The Holy Spirit came upon Mary to bring Jesus into the world. Likewise, the Holy Spirit comes upon us to bring Jesus to the world. Jesus was conceived in Mary, not the human way, but through a supernatural intervention from the Holy Spirit. God wants to do the same thing in us. Through the miraculous power of the Holy Spirit, Jesus is conceived in us and develops in us. Like us, Mary was not sinless. However, Mary was willing to bring Jesus into the world. Again, God desires to do the same thing with us. If we are willing, we can bring Jesus into the world. God wants the Spirit of Christ, the Holy Spirit, to be in us and to change our lives into the image of Christ so people will be able to see Jesus. That may sound scary to you—God in you, taking control, transforming you, and using you. It was scary for Mary. Luke 1:29 But she was greatly troubled at the saying, and tried to discern what sort of greeting this might be. An angel told Mary what God planned to do in her. At first, she was troubled, confused, and scared. Mary was going to become pregnant with God’s Son even though she was a virgin. She was engaged to Joseph. What would he think? What would her relatives think? What would the neighbors think? Nevertheless, Mary was willing to trust God and let Him use her even though her reputation would be ruined and her engagement to Joseph most likely destroyed. God’s plan for us can be troubling, confusing, and cause fear at first because we don’t understand God’s plan for us. What is God’s plan? Simply, don’t be afraid of God. Trust Him and be willing for Jesus to be born in you. Many of us are afraid of the Holy Spirit, who is God in us. We don’t trust Him. So we don’t ask our Father in Heaven for the Holy Spirit. We are afraid to give Him control. We are afraid of what people may say about us, because when the Spirit comes into your life, in a sense, you will be found to be “with child”—with Jesus in you. It will be noticeable. You will be different. You will become Christ’s witness—His ambassador. You will tell others about Jesus and what God is doing in your life because you love Him so much and you want others to experience His peace and joy, too. However, this “Jesus in you” creates confusion for some of your closest relationships. For example, Joseph didn’t understand what happened to Mary. When she explained it, it seemed too remarkable to him to be true. He decided to quietly end the betrothal. It took an angel appearing to Joseph and telling him the same thing he told Mary for Joseph to believe it. Matthew 1:19-20 And her husband Joseph, being a just man and unwilling to put her to shame, resolved to divorce her quietly. But as he considered these things, behold, an angel of the Lord appeared to him in a dream, saying, “Joseph, son of David, do not fear to take Mary as your wife, for that which is conceived in her is from the Holy Spirit. When the Holy Spirit is in you and Jesus becomes evident, some friends and relatives may reject you because they can’t understand what God is doing in you. But, they know something has happened because you are so different. They may end their relationship with you, because the Holy Spirit in you convicts them of their sin and their need to have Jesus born in them. On the other hand, those with the Holy Spirit in them will see Jesus in you and be excited. Luke 1:39-43 In those days Mary arose and went with haste into the hill country, to a town in Judah, and she entered the house of Zechariah and greeted Elizabeth. And when Elizabeth heard the greeting of Mary, the baby leaped in her womb. And Elizabeth was filled with the Holy Spirit, and she exclaimed with a loud cry, “Blessed are you among women, and blessed is the fruit of your womb! And why is this granted to me that the mother of my Lord should come to me? Elizabeth knew that something special was in Mary because Jesus’ presence in Mary affected her and her baby. Likewise, if Jesus is in you, unbeknownst to you, people will sense His presence because the Holy Spirit reveals Jesus in you to them. That is God’s will for us! Notice, it is not Christ “with” you, but Christ "in" you! This mystery is realized and experienced through the indwelling Holy Spirit that Jesus promised to those who love Him and keep His commandments. John 14:15-17 If you love me, you will obey what I command. And I will ask the Father, and He will give you another Counselor, to be with you forever, the Spirit of truth. The world cannot accept Him, because it neither sees Him nor knows Him. But you know Him, for He lives with you and will be in you. Christ literally lives “IN us” because the Holy Spirit lives in us. When we give our lives to Jesus Christ, our bodies become temples of the Holy Spirit. Therefore, we are to keep His temple clean and holy. Having Christ IN us is the big test of our salvation. This is a test we must not fail! Since the Holy Spirit in us is so critical to our salvation, how can we tell if Jesus Christ is in us? 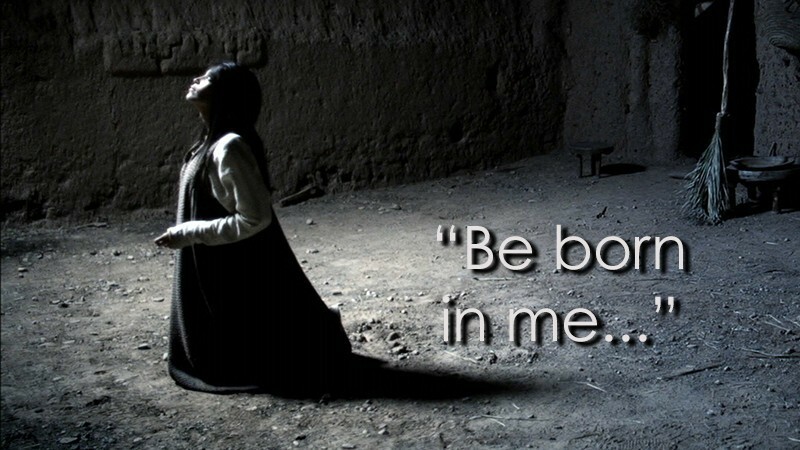 Jesus cannot be “in you” unless you have specifically asked Him to come in! He is not an intruder. When the Spirit of Jesus—the Holy Spirit—comes into us, He comes to cleanse His temple, causing us to see our sin and repent. This is the divine purpose for the human body—to be filled with all the fullness of God by being conformed to Jesus. When Jesus is born in you, the Holy Spirit begins a lifelong growth process to conform you more and more to the likeness of Jesus. This causes a struggle between the desires of your flesh and the desires of the Spirit. However, the Holy Spirit empowers you to deny your flesh, to stop sinning intentionally, and to live righteously. Christ in you is the key to victory over the devil and his temptations. You are no longer helpless when facing the devil’s temptations and the desires of your flesh. The Holy Spirit gives you grace and power to obey by crucifying your own will and desires. If you are crucifying your flesh, the Spirit of Christ dwells in you and produces the fruit of the Spirit in you. For example, if Christ is in you, then you will take more seriously the importance and purpose of your body, the temple of the Holy Spirit. 1 Corinthians 6:13 “Food is meant for the stomach and the stomach for food”—and God will destroy both one and the other. The body is not meant for sexual immorality, but for the Lord, and the Lord for the body. Before Jesus was born in you, the spirit of your flesh had complete control and you did as you pleased. Now the working of the Holy Spirit in you and the working of the lusts and weaknesses of the flesh creates a constant struggle to do what's right for God? Romans 7:21-25 So I find it to be a law that when I want to do right, evil lies close at hand. For I delight in the law of God, in my inner being, but I see in my members another law waging war against the law of my mind and making me captive to the law of sin that dwells in my members. Wretched man that I am! Who will deliver me from this body of death? Thanks be to God through Jesus Christ our Lord! So then, I myself serve the law of God with my mind, but with my flesh I serve the law of sin. Thankfully, the reality of Christ in us empowers us to have victory over the power of sin in our life! Because Jesus atoned for our sin on the cross, all condemnation is gone and we have grace to obey the Spirit instead of our flesh. Not only this, but because Jesus is God Almighty, Christ in us—the Holy Spirit, gives us the grace and power to be more than an overcomer against all our spiritual enemies! God wants to live in us. Will you allow Jesus to be born in you today? Christ in you, the hope of glory, is the Gospel. Jesus was born into this world to suffer our death penalty on the cross, so that by believing in Him as the Son of God, we would no longer be condemned to suffer eternal death. Then Jesus rose from the grave to sit at the right hand of the Father and live forever in you and in me through the gift of the Holy Spirit. That promise is Jesus Christ born in you by the Holy Spirit. To experience this new birth of the Spirit and Jesus living in you, repent of all sin and trust Christ’s atoning Blood on the cross alone for salvation. It doesn’t matter what you have done; His sacrifice atones for it. Confess your faith publicly and be baptized, which is a death to self. You will be forgiven, have a new life born of the Holy Spirit, and can look forward to living eternally in Heaven. You will also have the peace and joy that the angels proclaimed at Jesus’ birth because Jesus is born in you.